I am about to make a wildly audacious claim here: I think years from now we are going to look back on Al Ewing and Joe Bennett’s work on The Immortal Hulk as some of the most influential, game-changing work on the character. The Immortal Hulk 8 continues to push the limits of what we understand about the not-so-jolly green giant. 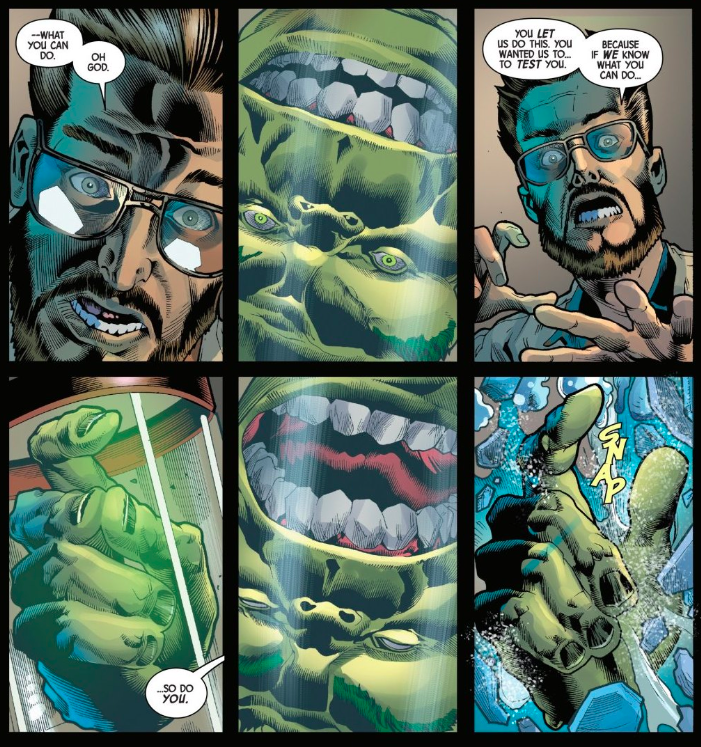 This time around we see that Hulk is as much of a scientist as Bruce Banner is. After being obliterated by Iron Man’s super-laser, The Hulk’s body has reconstituted itself and has been separated piece by piece and placed in glass jars. 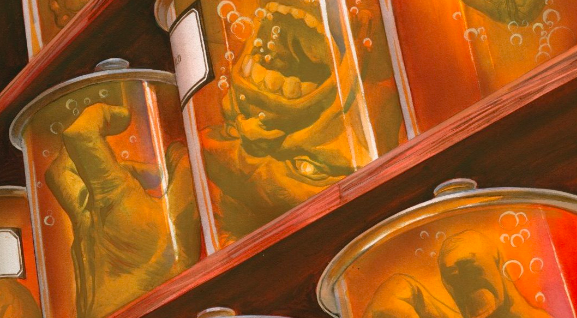 Dr. Clive — Hulk’s resident jailer and tormentor — is fascinated by the monster’s durability and titular immortality. Clive brings up a key tenant of any good science fiction story: “what are the rules?” Superman is powered by the sun and weakened by Kryptonite, there is some made up science behind it but that is the basic rule. How does the Hulk survive all that he endures? How do his individual body parts still function when they are detached? It turns out that Hulk is as curious as we all are. In modern storytelling, Hulk is portrayed as a little more intelligent than he once was – there’s very little “caveman speech” in comic book Hulk nowadays. 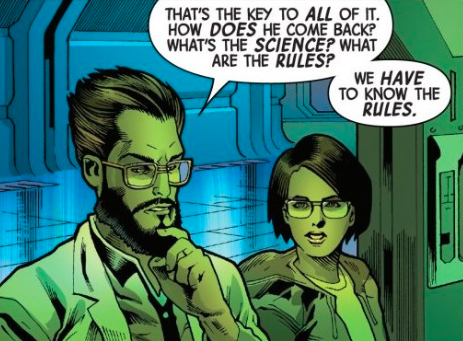 And while Hulk has insisted multiple times in this series that Banner is the scientist, his curiosity here suggests otherwise. Hulk may not have the same analytical mind that Banner does, but he wants to know what he can can endure if for no other reason than self-preservation. “Hulk is the strongest there is” – but how strong is that? There is so much going on in this spread. 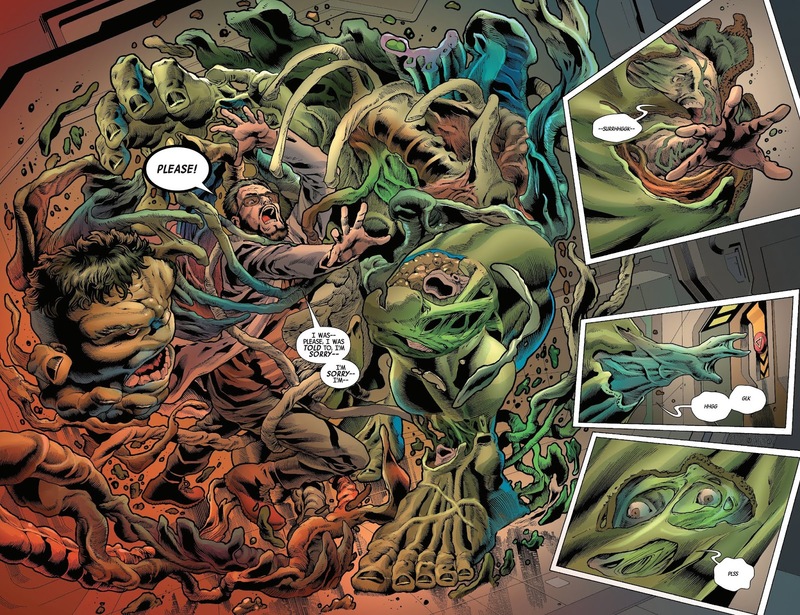 Hulk’s intestines and skeletal structure will themselves to life in a swirling hurricane of horrific rebirth. Not only does he enact his revenge on Dr. Clive by killing him, he full-on envelopes and absorbs him like he’s freakin’ Clayface or Sandman. I think my favorite touch here is how Hulk’s right hand secures his head throughout the whole ordeal. With only eight issues thus far I think that Ewing and Bennett have made their mark on The Hulk. I can only hope that they continue to thrill and horrify us for many more issues to come.